Whenever someone asks their parents something about the world of video games, and the parent isn't very enthused or educated about that world, there is a lot of potential hilarity to come out of that. In the case of a gamer asking his parents to name Super Smash Bros. characters, there's tons of hilarity to be had at the results. Reddit user Sunbolts asked his mother and father to name each of the characters in Super Smash Bros. for the Wii U and Nintendo 3DS. Some of the names that the parents toss out are pretty hilarious. Funnily enough the guy's mother is more well versed in Nintendo and gaming culture than the father is. They both obviously know the basics like Mario, Sonic, the Princess and Bowser. 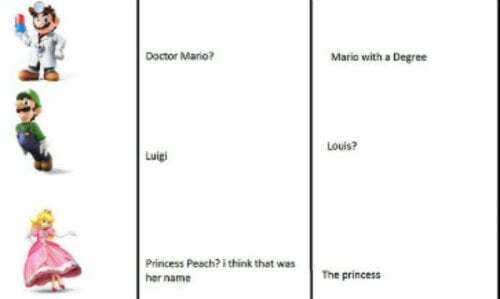 But then things start getting sketchy when people like Luigi ends up with the name “Louis” by the father, and Warior gets called “Mario on Drugs” by the mother. Careful calling Luigi “Louis”... you just might get the death stare. Samus, from Metroid, in her armor gets labeled as “Ironman” and “Astronaut Warrior C” (not sure sure where the 'C' comes from, but we'll roll with it). Zero Suit Samus gets an “I want that body” from the mother and a hilarious response from the father... “Your mom 20 years ago”. What's really weird is that later on the mother says of King Dedede “Your Dad” and the father says “Me”. What's so weird about it? Well, even further on they describe Ness, from the classic Earthbound. The mother's response for Ness was “You!”, and his father's response was “He was like you when you were a kid”. Quite naturally there were a lot of comments circulating around the genetic makeup of the family if the mother looked like Samus when she was younger, the dad looked like King Dedede and the kid came out looking like Ness. I'm not even going to bother trying to figure that one out. They both get Link's name wrong, with the dad mislabeling him as “Zelda”. The dad later calls the actual Zelda “Zelda's girlfriend”. Congrats, Nintendo now has an out and out gay couple in The Legend of Zelda. Speaking of gay couples... they parents had to name a few Pokemon. They didn't do so well. The mother managed to name Pikachu and Charmander (as I said, the mother was dropping knowledge bombs in some of this). The father on the other hand... well, he called Pikachu “Ash” and he called Jiggly Puff “Gay Pokemon”. I loved that R.O.B., got called “Wall E” by both parents and Captain Falcon was labeled “Captain America” and “James Bond” from the mother and father. Mr. Game & Watch is called “Black dude” by the mother and the father simply says “This game is on drugs and is racist”. You can read the full list of his parents' answers over at Reddit.